We had our first snowfall yesterday to welcome in the holiday spirit. I’m always amazed at how the first snowfall seems so magical. This year it was even more so due to the hideous fires still blazing in California. For two of my kids who are attending school in CA and coming home for Thanksgiving, seeing snow on the ground will be a special treat. So me being me I’ve been thinking about what I’ll be wearing fragrance-wise as I serve up the feast. My first thought was Dahlia Divin or Don’t Tell Jasmine but decided they were way, way too much with everything else going on in the kitchen. Overly floral scents can be a buzz kill on Thanksgiving. Perhaps a vanilla scent would be best. I adore the scent of vanilla and a subdued, almost hushed vanilla could be perfect. The question as always is which one. I thought about Tom Ford Soleil Blanc (of which I only have a sample size but love). It wouldn’t fit with the freezing temps though since it’s much more of a warm weather scent to me. Definitely not Angel! Wearing Angel would be enough to put everyone into coma. Cashmere Mist is nice but not special enough. The great thing about vanilla is that practically everyone loves it so no worries about offending anyone near me in the kitchen. But wait, something with tonka bean sounds even better. Tonka bean is similar to vanilla but has additional aromas of cherry, almond and something spicy resembling cinnamon. The clear choice here would be Bottega Veneta Knot, which I happen to have in my perfume arsenal. I haven’t worn it in quite a while either so Thanksgiving might be the perfect occasion to let it strut its stuff. It’s also a classy scent that would go well with my china. I might even layer Knot with something else. Clean Cashmere is one possible contestant. I adore the heliotrope note used here which reminds me of marzipan, vanilla, cherry pie and almond. The powdery heliotrope used in Clean Cashmere is part of what makes it such a relaxing comfort scent. Lovely cedar and sandalwood notes keep the scent from being too sugary sweet. Another wonderful layering option is By Rosie Jane’s James. James is a quintessential fall scent with intoxicating notes of fig, woods and amber. There is the teensiest touch of gardenia in James but it’s barely there. Plus, since James is both laid-back and down-to-earth, it would complement the divaesque Knot. Great! Glad that’s been decided. And for bearing with me through my Thanksgiving perfume rambling, I’d like to share with you my signature Thanksgiving side dish. It’s easy peasy to prepare and is a crowd pleaser. While not exactly lo-cal, it’s worth the splurge. Just be aware that once you’ve served this everyone will be wanting the recipe! Heat oven to 400 degrees. Coat a shallow 3 quart baking dish with oil and set aside. Heat the oil in a large skillet over medium-high heat. Add the shallots, ½ teaspoon salt and ¼ teaspoon pepper. Cook, stirring occasionally, until soft (6-8 minutes). Add the wine and simmer until evaporated (4-6 minutes). Meanwhile, in a large bowl, whisk together the eggs, cream, milk, nutmeg ½ teaspoon salt and ¼ teaspoon pepper. Squeeze the spinach to remove excess liquid. 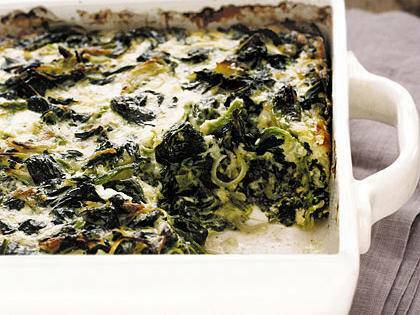 Stir the spinach, shallots, gruyère and parmesan into the egg mixture. Transfer to the prepared baking dish. Bake until bubbling and the top is golden brown, around an hour. *Can be made a day ahead and reheated just before serving. This entry was tagged Angel by Thierry Muglar, Baked Spinach and Gruyere recipe, Cashmere Mist by Donna Karan, CLEAN Cashmere, Dahlia Divin by Givenchy, Don't tell Jasmine by Vilhelm Parfumerie, James by Rosie Jane, Knot by Bottega Veneta, Soleil Blanc by Tom Ford.